Antonia Fresquez learned about California AgrAbility at a health fair in Sutter County. Around 12 years ago, Antonia suffered a spinal cord injury due to an occupational injury. Her L5 vertebra had ruptured causing immense pain and difficulty moving. She later had surgery to repair her L5 by putting in a metal plate to prevent further deterioration. The surgery was successful and reduced her pain; however, Antonia still has difficulty bending down. Her pain intensifies as she repeats stooping motions. On Antonia’s one acre of rural farmland, she has walnut trees, peach trees, and orange trees. It is easy for her to harvest her peach and orange trees because she simply reaches up to pick the fruit. However, it is extremely difficult for her to harvest the fallen walnuts as she has to repetitively bend down which aggravates her injury. 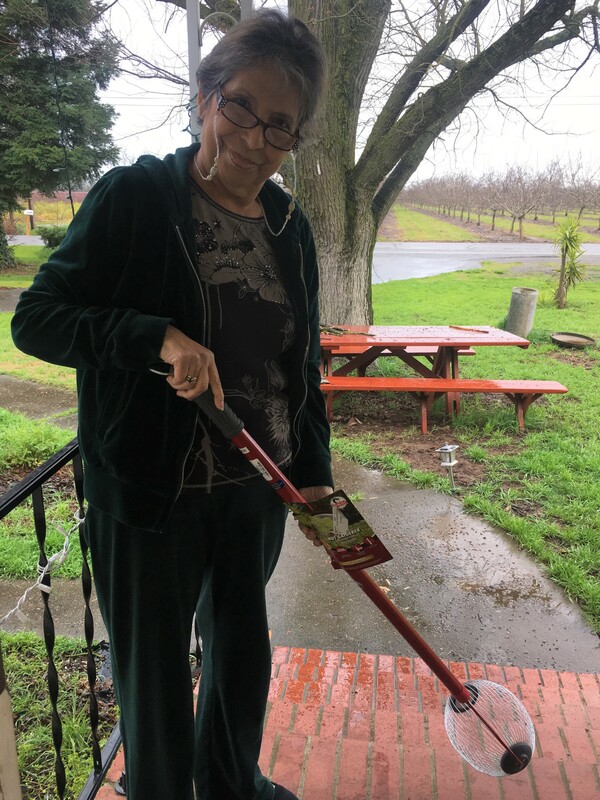 California AgrAbility staff connected her with the Garden Weasel’s Medium Nut Gatherer available on Ability Tool’s AT-Exchange Device Lending Library. Through this exchange platform, Antonia was able to try this tool out for free. To her surprise, she made over $100 off the walnuts she harvested from a couple of trees. She was even more happy that this tool allowed her to keep work safely and pain-free. She is now working towards opening an honor system farm stand outside her property.